The CPU copies data from memory to a subresource created in non-mappable memory. A pointer to the destination resource (see ID3D11Resource). A zero-based index, that identifies the destination subresource. See D3D11CalcSubresource for more details. A pointer to a box that defines the portion of the destination subresource to copy the resource data into. Coordinates are in bytes for buffers and in texels for textures. If NULL, the data is written to the destination subresource with no offset. The dimensions of the source must fit the destination (see D3D11_BOX). An empty box results in a no-op. A box is empty if the top value is greater than or equal to the bottom value, or the left value is greater than or equal to the right value, or the front value is greater than or equal to the back value. When the box is empty, UpdateSubresource doesn't perform an update operation. A pointer to the source data in memory. The size of one row of the source data. The size of one depth slice of source data. For a shader-constant buffer; set pDstBox to NULL. It is not possible to use this method to partially update a shader-constant buffer. the resource is created with immutable or dynamic usage. the resource is created as a depth-stencil resource. the resource is created with multisampling capability (see DXGI_SAMPLE_DESC). When UpdateSubresource returns, the application is free to change or even free the data pointed to by pSrcData because the method has already copied/snapped away the original contents. The performance of UpdateSubresource depends on whether or not there is contention for the destination resource. For example, contention for a vertex buffer resource occurs when the application executes a Draw call and later calls UpdateSubresource on the same vertex buffer before the Draw call is actually executed by the GPU. When there is contention for the resource, UpdateSubresource will perform 2 copies of the source data. First, the data is copied by the CPU to a temporary storage space accessible by the command buffer. This copy happens before the method returns. A second copy is then performed by the GPU to copy the source data into non-mappable memory. This second copy happens asynchronously because it is executed by GPU when the command buffer is flushed. When there is no resource contention, the behavior of UpdateSubresource is dependent on which is faster (from the CPU's perspective): copying the data to the command buffer and then having a second copy execute when the command buffer is flushed, or having the CPU copy the data to the final resource location. This is dependent on the architecture of the underlying system. Note Applies only to feature level 9_x hardware If you use UpdateSubresource or ID3D11DeviceContext::CopySubresourceRegion to copy from a staging resource to a default resource, you can corrupt the destination contents. This occurs if you pass a NULL source box and if the source resource has different dimensions from those of the destination resource or if you use destination offsets, (x, y, and z). In this situation, always pass a source box that is the full size of the source resource. 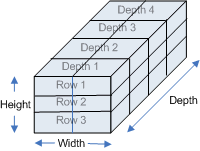 To better understand the source row pitch and source depth pitch parameters, the following illustration shows a 3D volume texture. Each block in this visual represents an element of data, and the size of each element is dependent on the resource's format. For example, if the resource format is DXGI_FORMAT_R32G32B32A32_FLOAT, the size of each element would be 128 bits, or 16 bytes. This 3D volume texture has a width of two, a height of three, and a depth of four. The following illustration shows the resource as it is laid out in memory. For example, the following code snippet shows how to specify a destination region in a 2D texture. Assume the destination texture is 512x512 and the operation will copy the data pointed to by pData to [(120,100)..(200,220)] in the destination texture. Also assume that rowPitch has been initialized with the proper value (as explained above). front and back are set to 0 and 1 respectively, because by having front equal to back, the box is technically empty. The 1D case is similar. The following snippet shows how to specify a destination region in a 1D texture. Use the same assumptions as above, except that the texture is 512 in length. For info about various resource types and how UpdateSubresource might work with each resource type, see Introduction to a Resource in Direct3D 11.